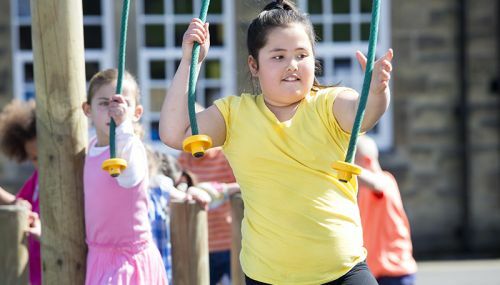 Overweight and obese children who are physically inactive are more likely to have poor wellbeing than their more active peers who are a similar weight, according to a new study. Researchers from Edge Hill University and the University of Limerick examined information on more than 6,000 7-year-olds born in the UK at turn of the century who are taking part in the Millennium Cohort Study. The analysis focused on children’s body mass index (BMI), their level of physical activity and parents’ reports of their children’s social-emotional wellbeing, which included measures of conduct problems, emotional issues, relationships with peers, hyperactivity and positive social behaviour. The researchers took into account background factors, such as children’s ethnicity, exact age, and whether they were living in poverty. To examine levels of physical activity, the researchers analysed data taken from activity monitors, which were worn by study members for seven consecutive days. The children’s results were separated by gender, and divided into four groups: least active, low to moderate, moderate to high, and most active. The findings revealed that for overweight and obese children, girls who were least active, and boys who were low to moderate, had the most social-emotional difficulties at age 7. Children who were carrying excess weight, but who exercised more regularly, did not tend to have poorer social-emotional wellbeing than those who were a normal weight. Overweight and obese children who were least active and low to moderate were more likely to have problems getting on with peers. Overweight and obese boys who were most active, and those who were low to moderate tended to have conduct issues. Boys who were low to moderate had emotional problems, but also displayed positive social behaviour. Levels of activity ranged from 43 minutes to 100 minutes a day for boys and 34 minutes to 81 minutes per day for girls. The report said that inactive children with a high BMI were at greatest risk of experiencing poorer wellbeing and “therefore, screening for social-emotional wellbeing difficulties in this population is a priority”. ‘Cross-sectional associations between body mass index and social–emotional wellbeing among differentially active children’ by Robert J Noonan and Stuart J Fairclough was published in the European Journal of Public Health.